My friends have often suggested to me that you can save money on food and have less waste by using a freezer. I had a small half and half fridge / freezer, but OH and I had had an ongoing debate about buying a second freezer. I just wanted a small one with drawers, nothing fancy. A few weeks ago I entered a meat raffle. The prize at the end of the month was £42 worth of meat from one of the local butchers. I was lucky enough to win and ended up with a chicken, bacon, gammon steaks, mince and stewing steak. I didn’t have space in my existing freezer for all this, so suggested to OH that we needed to go freezer shopping the following day. One of my neighbours overheard us, and offered me their spare freezer for free! OH and I wandered up Frugal Hill to collect the freezer the next day and popped our meat prize in it. I later found out that our new freezer had belonged to another neighbour before that, so we truly are recycling. Now I had a bit more freezer space, I have been able to buy half a pig from a friend who has a smallholding. I have been doing much more batch cooking and am finding that there is much less waste than before. I totted up our monthly spending this evening, and although it has just been a normal month, my food bill has halved. I’m definitely wasting less and thinking much more about how to use the food I have effectively. I’m a freezer convert – what have your experiences of having extra freezer space been? When I buy a household gadget, I tend to use it until it falls apart. Yesterday, my iron blew up. I’ve probably had it for about 10 years. It wouldn’t heat up, so I asked OH if he would have a look and see if he could fix it. He took it apart, but various bits of it had fallen apart inside, so I really was going to have to buy a new one. I went out for a run first thing, and then headed off to the supermarket. For once, I had my Nectar card with me. I hadn’t spent any points for a long time, so I thought I would just see if I could put a bit of money towards the iron. 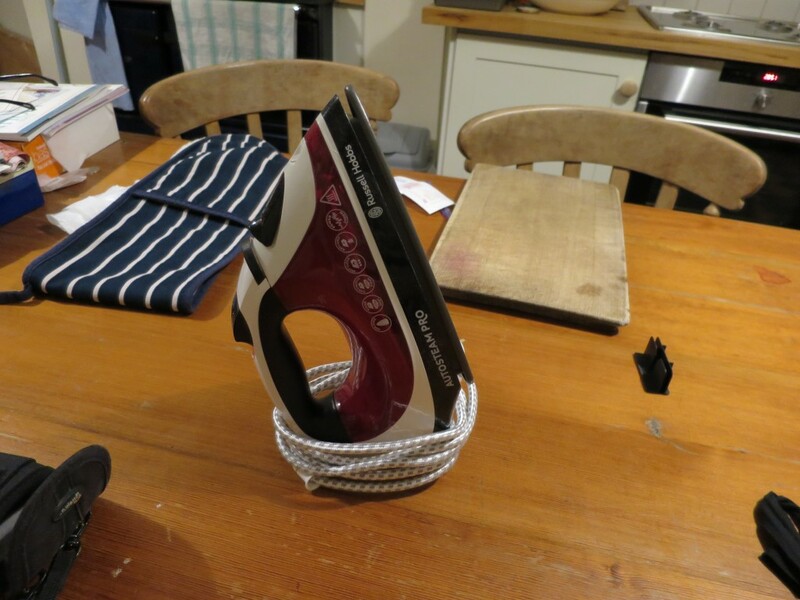 I was pleasantly surprised to find I had enough points to cover the whole cost of a new iron. I don’t collect points obsessively. I just collect them whenever I go to the supermarket, but this has made me think about saving them for something I might need, rather than just spending them on the food bill. Do you collect loyalty card points? How do you use them? I’ve had a pretty manic couple of months, but am slowly getting back to normal and finding time to do the things I enjoy. I had a bit of a clear out in the freezer the other day and found some gooseberrieswhich my friend, Piglet, gave me in the summer. I pulled them out and made some jam. Unfortunately I let it boil a bit past its setting point. It’s very tasty, but not quite as fluid as I would like. On Saturday I bought a kilo of Seville oranges from the market. I last had a go at marmalade a couple of years ago. I bought 3 kilos in a big bag, and it was far too much. I only finished the last jar a couple of months ago, and the results were mixed, mostly because I didn’t chop the oranges up finely enough. This time I chopped the oranges up as finely as I could and here they are bubbling on the stove. I had the oppostie problem with the marmalade to the gooseberry jam – not wanting it to set solidly, I left it for a little bit less time and it is a tiny bit on the runny side. I did the test with putting a plate in the freezer and it looked like it had set. I did think about boiling it all up again, but as it probably only needs a couple of minutes, I thought it would be better not to risk it. What did surprise me was that it made up 8 jars, so plenty to keep me going. 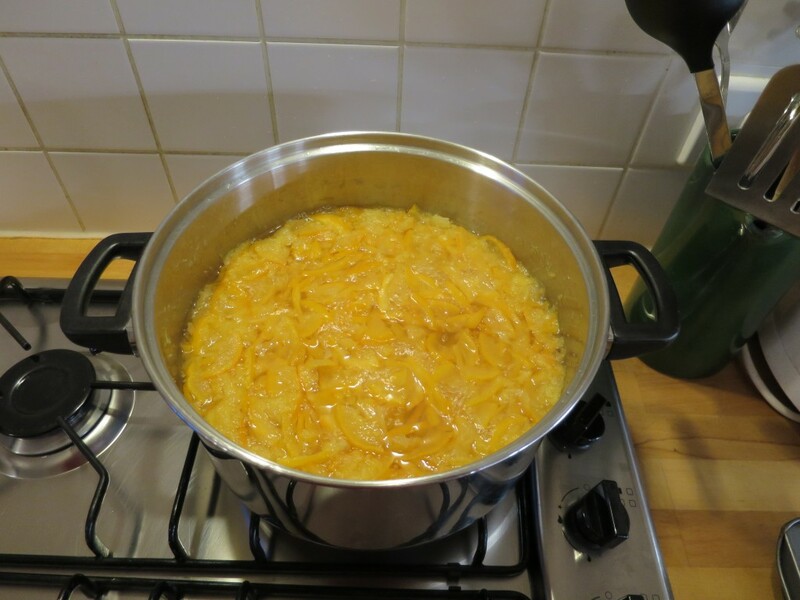 Have you made marmalade this year? How do you get on with getting jam to the right setting point? Oops. Really should have checked the recipe. I’m a bit behind with the sloe gin again this autumn. I’ve had the sloes in the freezer for about 3 weeks. It will be ready for Christmas – just. This afternoon I sat in the kitchen pricking away at the sloes. I’d got my jars lined up and the sugar and gin. I make sloe gin every year, so I didn’t bother to check the recipe and happily put 450g sugar into the jar along with 450g sloes and a bottle of gin. It looked a bit full, but I just carried on an shook it up. Oh well. We’ll just have to see how it turns out. Luckily I’ve only made one batch so far, so I will make sure I put the right amount of sugar in the other two. Has anybody out there made sloe gin with too much sugar? How did it turn out? It’s that time of year again where everything is coming in all at once. My mini greenhouse and three raised beds have done very well. I experimented with several different varieties of tomatoes and it has been great fun to find yellow, orange and purple tomatoes in the greenhouse as well as red ones. The cucumbers were also a success. I grew little ones and they were very tasty. We’ve had loads of runner beans too. The only things which didn’t do well were the courgettes. I didn’t get a single one and I think it is because I grew them in full sunlight. I will have to think about where I can put them next year. We’ve had a good crop of plums and I’ve made some jam and am going to bottle the remainder. I picked some sloes yesterday and need to get on with making some sloe gin for Christmas. I’ve put a load of blackberries in the freezer ready to make jam later on when I have some spare time. I would like to try and grow a bit more next year and put some more veg beds in and sort some fruit out. I’ve got a couple of blackcurrant bushes which aren’t in a very good place, and the rhubarb I thought was dead has come back to life, but needs moving too. How did your growing go this year? I’ve had to do a lot of clearing and tidying in a very short space of time as we have had some visitors to stay recently. I find letting go of clothes relatively easy, but when it comes to books, they have to be prised out of my hands. 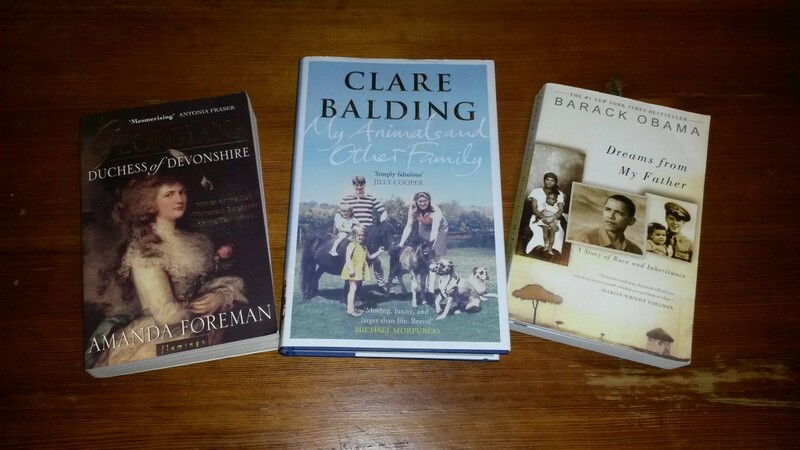 The Clare Balding book is on our book club list for this year, so I picked it up, along with the other two which I have wanted to read for a while. Total cost? £1.50. So I got a frugal bargain, but I am going to have to pass them on when I have read them so I don’t add to the book clutter. The other thing I did recently with one eye on the piles of books was to buy a Kobo when it was on offer. Again, I’ve bought a couple of book club books when they were reduced, and at least they are out there in the ether somewhere. I didn’t grow anything last year as everything was a bit hectic. This year I’ve just stuck to a few plants and it’s not gone too badly. 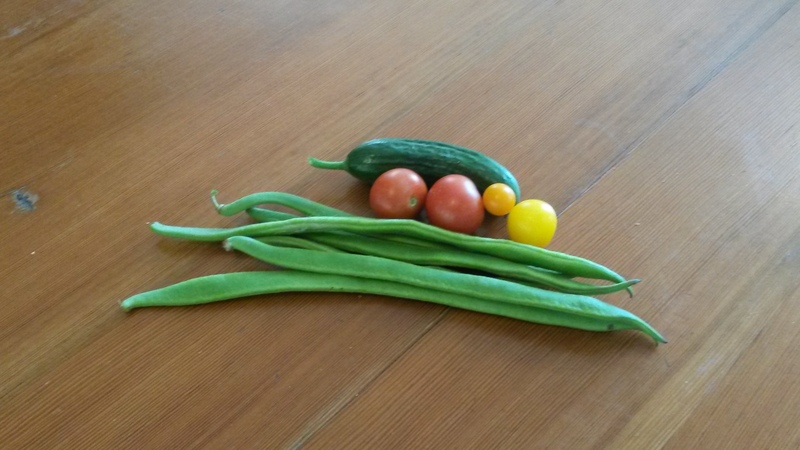 Here are some of the veggies I picked this morning. 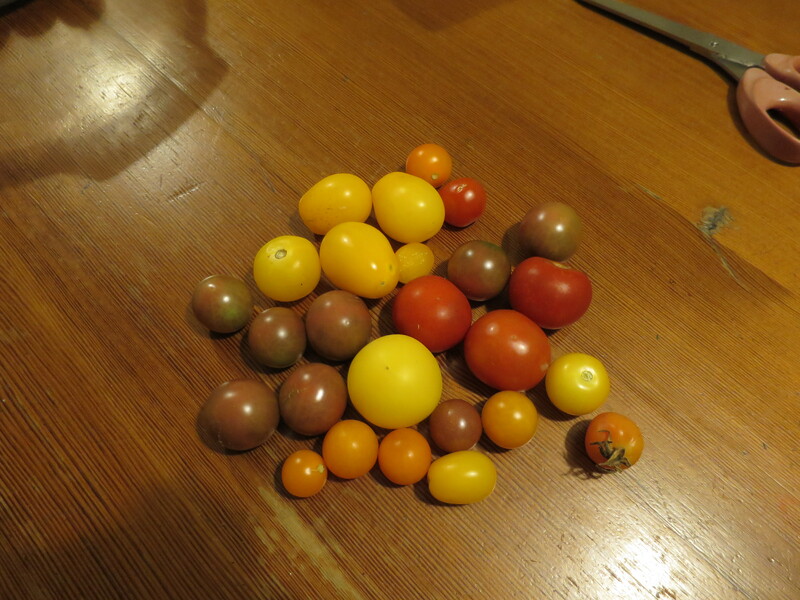 The tomatoes are just starting to ripen, and I’m glad I’ve tried different colours and varieties. The cucumbers have just finished, and the runner beans are in full flow. The one big failure this year has been courgettes. I think the raised beds are actually exposed to too much sun – I didn’t have much luck when I grew them before, so I will try and move them somewhere else next year. Our plum trees are also about to produce a bumper crop. You might remember that two of them snapped in half during a heavy snow fall on Boxing Day. They are now growing again from where they snapped off and I’ve had a few plums already – they taste delicious. Over the winter I want to sort out some more raised beds and think about what else I could grow. It’s all about experimenting to see what will work. Have you had lots of veg from your garden this year? 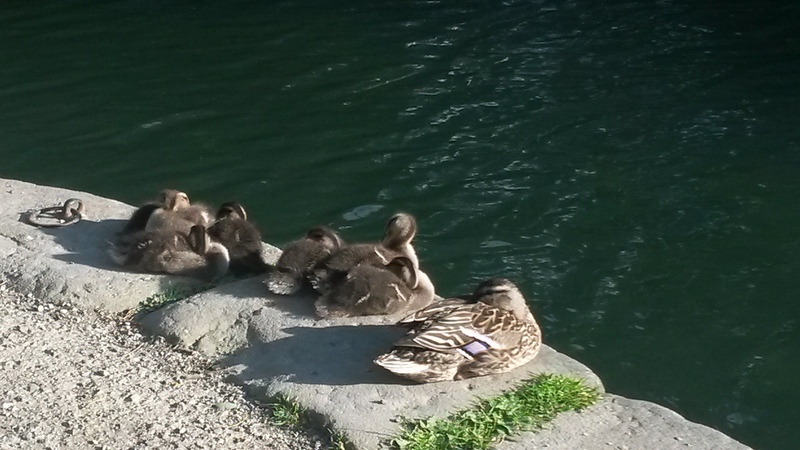 We have visitors at the moment, friends of Bee and Edie. We haven’t had people to stay for a while, and this has necessitated a huge clear up and clear out. Both the girls went through their rooms and cleared them thoroughly. I got caught up in this as well, and you suddenly get to a point where you realise you have just got too much stuff you don’t love or use and it has got to go. 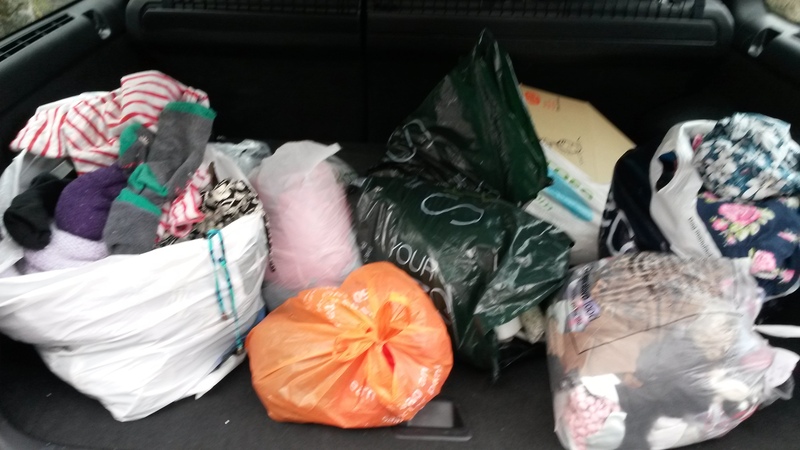 This is the second load which filled the boot and went to the charity shop. I am following my friend Piglet’s advice and as soon as I have a bag of stuff, it goes in the back of the car and then then next time I am in town with the car, I take it straight to the charity shop. While I was unloading last week and going into and out of the charity shop, I realised just how much stuff is already out there that could be recycled and reused at relatively little cost. It might mean a bit of extra work to hunt things out, and you can’t decide ‘I want X’ and then just go and get it. I am also thinking of getting my sewing machine out of retirement so I can alter things I buy from charity shops. Bee is brilliant at this, she can make something out of nothing and has made hangings and cushion covers as well as altering clothes. There are some things I do have trouble finding in charity shops – I’ve never found a pair of trousers simply because I am tall with long legs. Where I’ve been successful over the years is with tops, jumpers, cardigans, coats, books and crockery. Are you finding more of the things you buy in charity shops? If you have followed my blog for a while you will know that I have an ongoing battle with clutter. I still find it hard to let go of things in case they ‘will come in handy’. At the moment I’m in training for my first ever 5k. It’s a bit out of my comfort zone, but afer a bit of a shaky start I have been going out 3 times a week every week to run along the canal, running a little bit further every week. I’m beginning to enjoy this as there is always something to see. Today it has been raining heavily. I was determined to go out running, and so I dug out my oldest T shirt, my oldest joggers (which have holes in them) and my very old mac which should have been chucked years ago. It leaks like a sieve, but everything did the job. This was a case where I was glad I had kept some tatty old things which it didn’t matter if they got wet and muddy – everything just got dumped in the wash.
What do you keep ‘just in case’ that you find yourself using? Edie came home from Uzbekistan last week. Her year living as an ex-pat teaching assistant is over. She’s having a few weeks off and will then be looking for a permanent job. She’s now pretty fluent in Russian and wants to use her languages, so we hope she will find something before too long. Until then, she is back home living with us. It’s all a bit odd after 5 years away, but there isn’t any other choice until she finds work which will pay the rent. It never occurred to me that we would have the kids boomerang back to us, but we are learning to adjust, helped by the fact Edie makes brilliant cakes. OH and I discussed the other day whether we might be able to help a bit towards a house deposit. We always said that when the girls finished university, we wouldn’t be able to contribute any further as we want to retire before we are 80. Now we are not so sure – it’s trying to balance wanting to stop working with trying to help the girls. Luckily neither wants to settle down yet. I think Edie might well work abroad again, so there is time to do a bit of saving. So we are going to carry on living as frugally as we can and saving – whether it goes towards letting us retire a bit earlier or a house deposit remains to be seen. Have your adult children returned home to live? How did you find it?